Like many small colleges Wheaton College wasn’t much to speak of in its early decades. Small colleges didn’t attempt to offer what the big land-grant universities did and that was why so many continued to survive, despite economic ups and downs. The life of the campus wasn’t in state of the art facilities. 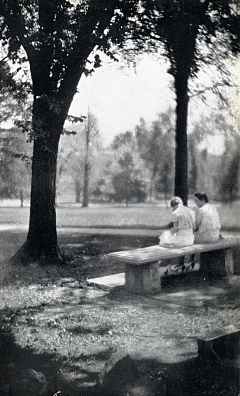 Margaret Landon well remembered her first visit to Wheaton’s campus in the early 1920s. She recalled her “sentimental journey” in the January-February 1938 Wheaton Alumni News that event. The dorm smelled of kerosene. The reception rooms were drab, and the dining room unrelievedly ugly. There was one pinpoint of light. Two students, who had not gone home for vacation consented to show us their rooms. Their suite was cheerful and home like after the rest of the building, and the two students themselves were charming and friendly. Then, as now, it was the students who made Wheaton…. I was in Wheaton many times last fall before I ventured up onto the campus, for the campus was peopled with many ghosts and I was disinclined to stir the dead leaves of memory…. I saw the old Chapel, which is now a part of the library. And went up to the dorm to the room where the two students had been kind sixteen years before–I roomed with one of them my freshman and sophomore years–and thought of my first night in college when my new roommate and I breathlessly hauled up a pint of ice cream on a string past the Dean’s window. Trum Howard, who furnished the ice cream, could just as well have rung the bell and handed the ice cream to us, but it was much more exciting the other way. Suppose we had plopped the whole carton against Mrs. Garlough’s window! Delicious thought! Born September 19, 1841 in a log cabin in Homer Township near the present Lockport, in Will County, Illinois, Adeline Eliza Collins was the only child of Fredrick and Nancy Mason White Collins. Addie attended Oberlin College in 1858 but transferred to Wheaton because it was nearer home and when she learned that it was open and that women might study there. 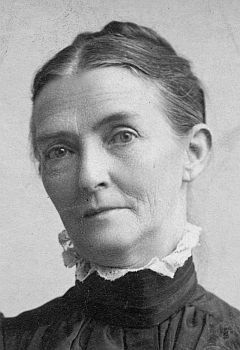 From materials in the Archives and alumni records it has been established that Addle Collins was Wheaton’s first woman graduate in 1862. 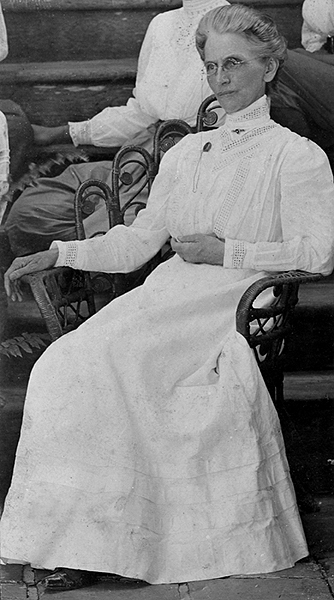 Known as “Addie” to her friends and associates she was later to become Principal of the Ladies’ Collegiate Course. When Addie left the principalship in 1865 the young women of the college gave her a set of Browning poems and a letter of appreciation was signed by O.F. Lumry, secretary of the faculty and president, Jonathan Blanchard. Two years later Addie married Henry D. Hatch and lived on a farm near her childhood home. They gave a portion of their land for the building of a Congregational church in which Addie later played the organ and taught a Sunday school class. Henry and Addie had one daughter, Emily Ellen, two grandchildren and two great-grandsons. Though Sandburg receives screen credit for “creative association,” his exact contribution to the project is not fully known. He received the job on the recommendation of Ray Bradbury, who declined the studio’s request that he write the script. Sandburg, born in Galesburg, Illinois, where Wheaton’s first president, Jonathan Blanchard, also served as president of Knox College, wrote in his autobiography, Always the Young Stranger, a rather unflattering portrait of the ever-crusading Blanchard, describing him as “…not one bigot but several.” He felt that Blanchard’s influence, which wasn’t cast in any positive sense, was present for decades after his departure, so much so that one could almost “catch the ghost of him.” To Sandburg Blanchard was the amalgam of a lion, bear and buffalo, and possibly half horse and half alligator! 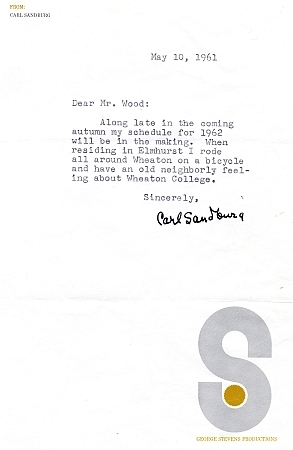 Sandburg died in 1967. His ashes are interred beneath a boulder called “Remembrance Rock” in the backyard of his childhood home in Galesburg. Baby Born in Blanchard Hall!! In 1895, Oliver Decker brought his new bride to live in an apartment in the west wing of the College Building, as it was known then. He operated a bicycle shop on the premises, which was advertised in The College Echo, the yearbook. While his family lived there, his wife, assisted by a female physician (possibly Frances Carothers Blanchard), gave birth to a baby girl named Hazel. Plans for a new Blanchard Memorial Building were made soon after the death of Charles Blanchard. It was later decided that funds raised for the project should be applied toward constructing the final (east) wing of the Main Building. Once completed it was named Blanchard Hall to honor both Jonathan and Charles Blanchard. The development of this building spanned nearly 75 years (1853-1927) and the administrations of three presidents. 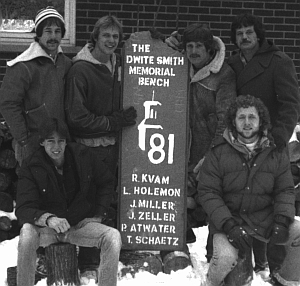 The Senior Bench at Wheaton College is one of the oldest and most legendary rivalries in the school’s 150 year history. According to dusty archives files and whispers of oral tradition, the graduating class of 1912 is believed to have bequeathed a hefty concrete monument to solidify its place in the annals of her alma mater. Anchored in front of Blanchard Hall and first photographed for the 1934 Tower yearbook, it was intended for seniors only, but through the decades envious undergraduates soon coveted it’s prized status. A great rivalry began in 1949 when juniors from the class of 1950 stole the top two foot by seven foot section while the seniors where away on their annual retreat. Many ingenious, inventive, and sometimes illegal methods have been employed by rival classes in their passionate pursuit of securing this nearly 800-pound stone slab. During the 1950s an exact replica was cast by the class of 1957 in a fool hearty attempt to trick the other classes, yet to no avail. The class of 1959 is heralded for one of the most amazing bench showings as it suspended the bench from a helicopter and flew it over the Homecoming football game. Another infamous bench caper was hatched when seniors from the class of 1963 traveled by train to Colorado for their yearly retreat. As the train stopped at Mendota, Illinois the bench was shown by the juniors who had arrived by car to taunt the seniors. A melee ensued and a scheduled thirty second stop erupted into a two hour delay as railroad agents, local police and the Interstate Commerce Commission were all summoned to sort out this violation of federal law. The current rules surrounding possession of the bench were enacted after seniors from the class of 1966 showed the bench in chapel and were greeted by slashed tires and cut ignition wires in the parking lot. The bench was confiscated by the Dean of Students and mysteriously destroyed while under lock and key. A replica soon surfaced and the tradition was resurrected. Henceforth all bench activity has been limited to the junior and senior classes, the bench must remain within a fifteen-mile radius of Blanchard Hall, half of the bench must be visible at all times, and the bench must be shown twice a year and never in chapel. In subsequent decades the passionate rivalry has ebbed and flowed as soil analysis kits, airplanes, wiretaps, high-speed car chases, Billy Graham, wishing wells, and even eBay, have all been employed in pursuit of this elusive prize for all Wheaton students. In 1865 the 117th Illinois Infantry Regiment fought in the final battle for Mobile. During the campaign, young William T. Osborne (born in slavery near Monroeville, Alabama, the setting for To Kill a Mockingbird) attached himself to the soldiers, who turned him over to Colonel Jonathan Merriam. Later, William took charge of Merriam’s horse, Frank. Part of the larger Mobile Campaign, this encounter was the one of the last official battles of the Civil War. As the battle commenced, a Union force with 16,000-strong marched against a much smaller Confederate army composed of just 4,000 soldiers. The battle lasted only a few hours, and the Union army won by sheer size alone. When all was said and done, only 200 Confederate soldiers escaped; nearly 3,400 were taken as prisoners of war to Ship Island and another 250 lost. William Tate Osborne was born in Alabama, according his death certificate, on February 12, 1855*. While at Wheaton, Osborne resided in local homes and in Blanchard Hall for his final year. Osborne became the first Black president of the Beltonian Society and was remembered for his good oration skills and singing voice. He received his Bachelor of Arts degree in 1876. William Osborne was a member of College Church from 1869-1878. Upon leaving Wheaton College, Osborne moved to Quincy, Illinois. In 1878 he crossed the Mississippi River and lived in Monroe City, Missouri, the same year marrying Miss Parthena Buckner. In 1885 he lived in Shelbina, Missouri. 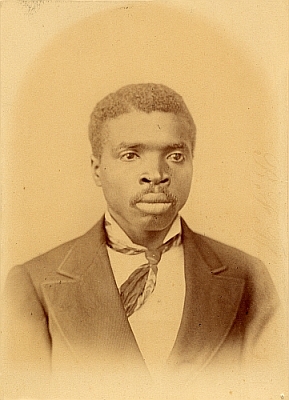 Mr. Osborne became Reverend Osborne in 1886 when he was ordained as a minister in the African Methodist Episcopal Church. Along with these residences Osborne lived and pastored churches in Seattle, Washington, Helena, Montana, Louisiana, Missouri, and Omaha, Nebraska. During his 1912-1917 Omaha pastorate, Osborne would be married to Earline (also known as Pinky). It is not known if he remarried or was widowed. The 1920 Kansas City census informs us that he rented his home, lived in a black neighborhood, and he and both his parents were born in Alabama. He pastored the Ebeneezer African Methodist Episcopal Church and became bishop of the denomination. Osborne died January 15, 1932 of chronic nephritis at his home (2811 Vine, Kansas City, MO). In 1987 students formed The William Osborne Society and exists to promote self-identity and self-awareness among Black American students. With the exodus of the library from Blanchard hall comes a historic narrative–the story of a building and of books. Back in 1860… the library as such was non-existent. 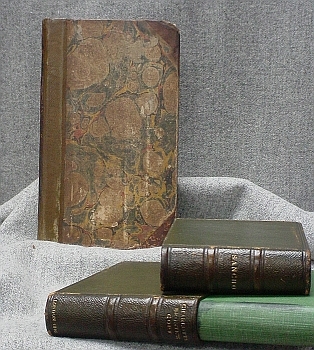 The only texts were the private collections of the instructors. Blanchard Hall began to grow in 1868. …Then old third floor Fischer library became the chapel, replete with green-upholstered pews. The classrooms clustered around the center section, now used by the business offices. Right after this came the building of the Tower in 1871, Blanchard’s roof was raised to form the chapel room. In those days there were stairways on either side of the building, outside, And Pres. Jonathan Blanchard had letterheads printed even then with the drawing of Blanchard hall, exactly as it is now. Third floor west end housed the girls. The boys’ “dorm” was on the floor above. There was even an elaborate elevator to haul coal, ashes and occasional enterprising individuals up and down. Winters were cold, and coal stoves were in vogue, and atomic solar heat was still some decades away. 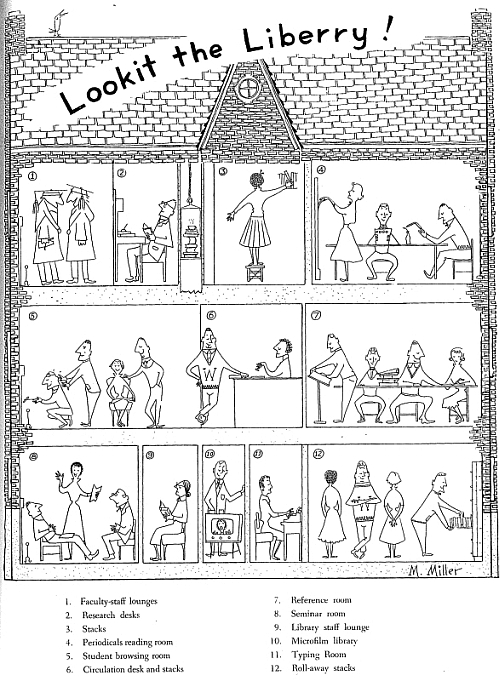 The present physics lab was originally a large, well-kept parlor, while the chem. lab directly beneath it served as dining hail and kitchen until 1927, when another general shifting took place. Loyal Celts and Belts held forth in what are now the first floor finance offices. Aels scheduled their society for the present biology lab. Meanwhile, the library was growing. As books accumulated, a small room was reserved for them in the first floor center section; the music teacher was dismayed to find himself in charge of the room. Several years later, the shelves transferred one floor up, and the books were moved en masse into what is now the registrar’s office. 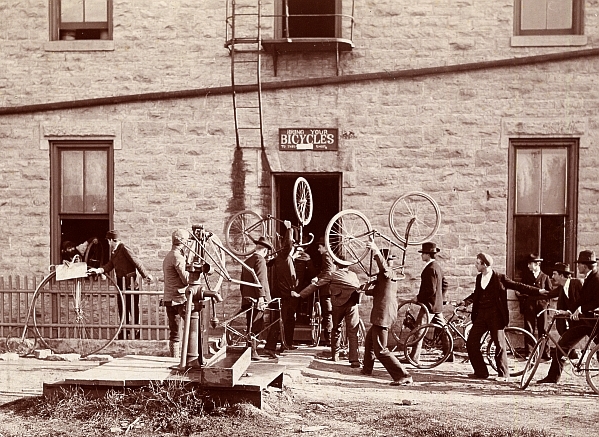 1890 was an epic date for Wheaton. That was the year a great pipe organ was installed in capacious Fischer chapel. It was the first pipe organ in town, and Wheaton folks were rightly proud. As a result of this, the chapel had to be rearranged. Opera chairs were installed, $1.25 apiece, the old green-upholstered pews migrated to various back yards and front porches, and some even lined the walls of the new library room. In 1890, too, central heating was installed in the basement, creating an audible hazard for the chapel worshipers up on third floor. In addition to books, the new library room housed the book store, which was operated: by students until 1908, when the college took over. By 1913 the college owned an amazing 10,000 volumes, all of which were arranged according to shelves A, B, C, section 1, 2, 3. Professor Rice had heard of a new-fangled Dewey decimal system, and so one summer he and three daughters, with a $600 stipend, catalogued the entire library. This was the beginning of the modern Wheaton college library. 1927 was another great year in the history of books and buildings. That was the year the final east addition was made. Included in the wing was the Frost reference library, into which many of the books were moved. It was not long, however, before the library was again bulging at the seams. Consequently, in 1936 the stacks were removed from E201 and placed in the former Fischer chapel. This necessitated an entire reinforcement of the center section of Blanchard from the basement up. Two years later the final segment of stacks was added in Fischer. Since 1938 Wheaton has experienced more growing pains. Enrollment doubled, the library grew and grew. And then in 1950 came Pres. V. Raymond Edman’s announcement in chapel of the gift of the new library building. That library is now a reality. This is the newest chapter in the story of buildings and books. A common experience in my work as a curator of rare books and manuscripts is that of rediscovery. Once such example of this rediscovery is this volume. 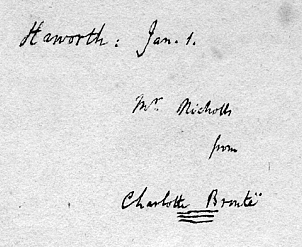 It is Charlotte Bronte‘s autograph presentation copy to her future husband, Arthur Nicholls (inscribed on the fly-leaf and title page) and contains Nicholls’ marginalia written after Bronte‘s death. Nicholls was a curate in Bronte‘s father’s parish and his marriage proposal in December 1852, came as a complete surprise to Charlotte and her father. Mr. Bronte withheld his consent, partly because he thought Charlotte was too frail to survive a pregnancy, and Charlotte declined the offer. Mr. Bronte was angered by his curate’s presumption, and made life so uncomfortable for him, that Mr. Nicholls resigned and left the village. He took a curacy at Kirk Smeaton, forty mile south of Haworth, and corresponded with Charlotte. By late 1853 they were meeting secretly near Haworth, and by Christmas, Charlotte had accepted him and persuaded her father to agree. They were married on the 29th of June 1854 and honeymooned for a month in Ireland. Their marriage was very happy and tragically short. At the turn of the year, Charlotte developed chronic sickness, became weak and emaciated, and, on the 31st of March 1855, she died in the early stages of pregnancy. Nicholls stayed on to look after Mr. Bronte until his death in 1861. He had hoped to take over the parish after his father-in-law’s death, but he was overlooked. He returned to Ireland and took up farming and never worked as a priest again. In 1864 he married his cousin and never had children. Nicholls, as the last remaining member of the Bronte family, spent the next forty years defending the Bronte name against an endless series of biographers and curio-hunters.